Finally, the wait is over, Gigtricks Main Sale as the title suggests is finally live. There is more to it, the Token Sale duration has been revised to 1st September to 31st December 2018. Flabbergasted? Yeah, right! The motive behind the extension of the main sale is to provide the buyers and interested investors, with sufficient time to have a grasp on the GBTC tokens. The time for sale is 0001 Hrs UTC/GMT on 1st September which will be closing on the 2359 Hrs UTC/GMT on 31st December 2018. During the Pre-Sale, GigTricks has attained a milestone and raised 2.834 million USD i.e. achieved its 2.5 million USD soft cap remarkably. During the Main-Sale Gigtricks is providing different discount tier. The bonus scale below will give you an idea of the active discount tiers throughout the main-sale. For the first week (1st Sept — 7th Sept), 25% discount will be rewarded for the earliest GBTC buyers in the main sale, whereas 15% discount will be active from 8th Sept to 14th Sept 2018. For the 3rd week (15th Sept — 21st Sept) 10% and from 22nd Sept and onwards 5% discount will be active. 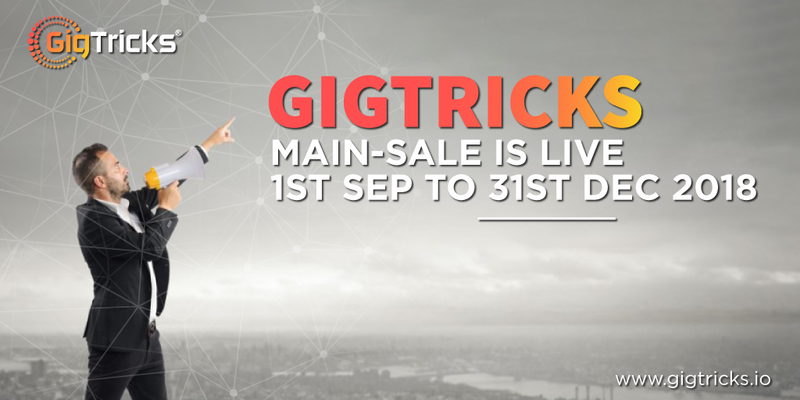 Now is possibly the time to gain the utmost from the discount tier, so quit wondering and start acting as the Gigtricks Main-Sale is live. Buy GBTC tokens now and become part of this on-demand ecosystem! World’s first complete 360-degree integrated and freelance ecosystem. An ecosystem that has envisioned to nurture opportunities in the freelance and on-demand economy.